These days, helmets are an essential piece of your ski kit. But how can we tell a good ski helmet from a bad one? 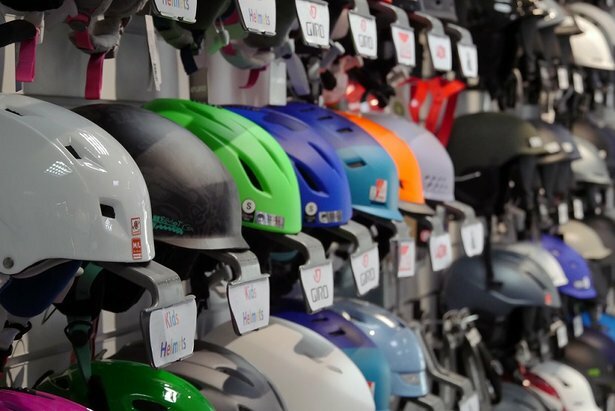 We spoke to expert buyer Scott Hargrave of winning ski retailer Edge & Wax to find out exactly what you should be looking for in your headgear. What should first timers be looking for? Correct fit and comfort, in that order. How snug should the ski helmet feel? It should feel like wearing a beanie hat, with no pressure points, and no spaces. If a ski helmet is not fitting correctly, it won’t be protecting your head! For correct fit, measure the circumference of your head with a piece of string or measure above your ears. This is your head size. Ski helmets come in different shapes, generally round or oval and one of these shapes will fit you better than the other. How many different types of ski helmet are there on the market and how much do they vary in price? There are hundreds, ranging in price from £40 to over £600 for race helmets, although the average price for a high quality, ventilated and easy to adjust ski helmet is around £100. Is there such a thing as buying too basic? No, but there is buying unsafe! The ski helmet MUST fit correctly to work, and must be to an approved standard to be safe for mountain sports use. In your opinion, what are the features on a ski helmet that are essential? Can you list five key things? What else do you consider important? Integrated technology – Once the fit is sorted, then you can consider other options such as audio compatible ear pieces, integrated action camera mounts such as Go-Pro Audio compatibility, or removable ear pads, to make your time on the mountain even more enjoyable, and most importantly safer! Additional safety – Some ski helmets come with additional features such as MIPS or impact protection. These systems reduce the forces going to your brain in the event of a fall or strike and are becoming more common and affordable. Venting – Ski helmets come with a variety of venting options. Some have removable plugs for spring conditions. Others have a slider to adjust the air circulation on the fly, ideal for those who often get hot-headed! Goggle compatibility – Modern ski helmets now cope with most goggle designs including the latest larger lens models, but you should check the fit with your goggles. You don’t want that gap too big between you helmet and goggle – A.K.A the “gaper gap”, or sometimes worse! Do expert skiers and snowboarders or those that take more risks of falling need something different from their helmets? All ski helmets are required to be of a certain standard to meet EU certification. For freestyle skiing, skiers may go for a slightly more durable outer shell for durability – although it is heavier, and a helmet should still be replaced after any impact! What are the best/safest ski helmets on the market? If a ski helmet meets the EU certification then it is a safe helmet. Although different models are not certified as ‘safer’ or ‘better’ than others, those with energy absorbing designs such as the M.I.P.S system offer additional protection for the user from the initial impact, reducing the energy reaching your brain. Should we watch out for ski helmets that don’t meet the European standard? There are 3 standards to watch out for – The European EN1077, North American ASTMF2040 or new Canadian CSA Z263.1 standards. A certified helmet will normally have one of these standards. For ski racing helmets, these are required to meet EN1077A AND ASTMF2040. There are even additional standards within these. For the rest of us, just one standard is good. If it is not certified then my advice is not to buy it! Thank you for your advice Scott!